James Gaudreault. B-Side. Skiers starting down Jester. While winter slept stubbornly through the early days of December, my friend and I spent our Saturday scraping the icy slopes of Sugarbush. We arrived late in the morning and found the elements at the base of the mountain caught in a fierce war. The muddy earth and wilting meadows were battling snowfield troops down the slopes from their wintery kingdom. James Gaudreault, B-Side. Rime ice clinging to summit trees. 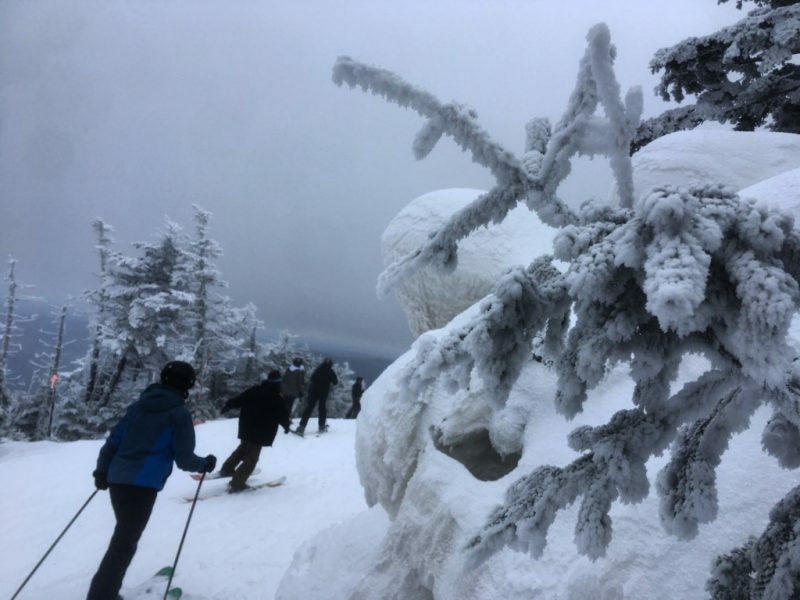 Despite the fake snow blowing from cannons, the woods and far edges of the lower trails clung to the earthen fall palettes, refusing to allow skiers more than a few icy routes down to the lift. Before we set out, we hobbled down the iron steps to pick up our ski passes, clinging to the handrail as our early season legs tripped along. 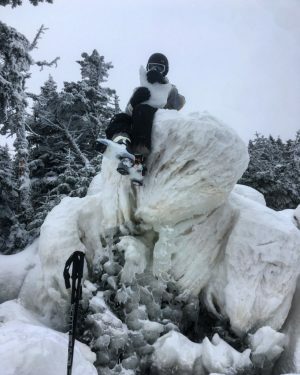 After a brief wait among the few hungry enough for those scarce early winter tracks, we climbed back up the gauntlet of stairs and rode our first lift to the peak. The contrast in climate between elevations can be magnificent, especially during the first weeks of winter. In minutes, the stubborn grassland and rushing streams gave way to a sheet of white coating the trees and wooded glades. All the energy and warmth of the base is locked in an icy cast of winter placidity. We pushed off the lift only halfway to the summit, already in a different world. James Gaudreault, B-Side. PJ whittling while the food stews. Our skis’ worn edges struggled to find purchase in the ice on the first few turns. As we moved through the groups of skiers, we found that the best snow lined the trail’s edges in thin strips. After a few decent runs we turned our attention to the summit hidden above us beyond the rolling clouds. The Heaven’s Gate lift brought us closer to winter; each foot of elevation added a new layer of drift to the trees and trails below. As we rounded the peak, we were transported to a spot above the clouds. Each fir tree lining the crystalline hills was coated in its own shell, drooping under the heavy ice. Before adventuring down the more promising summit trails, I shed my skis and clambered to the top of the lift to rest and look around. In the warmer months when snowless slopes call for hiking, I have to work for every inch of altitude. Hiking demands an appreciation for the mountain views; every rock, root and stream I pass is a milestone in my climb. I feel a certain intimacy with the rock beneath my feet. Each time the trees part and give way to the rolling hills and adjoining peaks, I have no choice but to stop and look. In winter, as I sat there on the summit, I made the resolution to sit and reflect every mountain day, regardless of the season. Later in the afternoon, our unconditioned legs wobbled. We watched others filter into the lodge to spend their paychecks on fries, but we unclipped our skis and took to the woods instead. We walked off-trail to a spot among the trees. 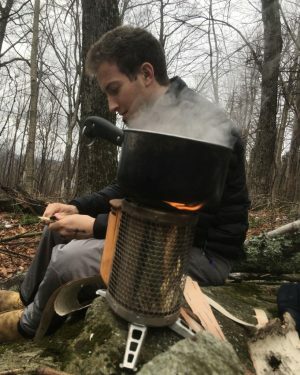 With a stacked pile of birch tinder and dead twigs, we fired up a wood-burning stove and cooked a mountain feast. PJ Solomon, B-Side. Tending to the food. 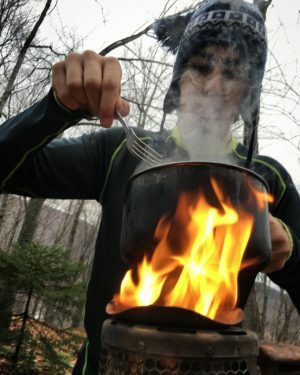 Every meal tastes better on the mountain, and this one was no different. As we ate, we discussed our adventures so far, planned a few more runs and basked in the glowing contentment that always follows a day in the clouds. The snow was sparse, the day was short, but the reward of just getting out was unmistakable.